Finding worship songs for youth groups is usually a task that is given to the leader of a youth group or to the pastor of the youth group's church, but it can also sometimes fall on the members of the group. Finding good music that teenagers will like and be able to relate to might seem like a hard task for a youth minister or even a whole youth group, but there are many worship songs for teenagers and young adults that can be used in a youth worship service. In addition to youth group activities, finding songs that will work around the campfire is a must have. You need the songs to be fun and memorable. Additionally, depending on the tech available, you need it to be easy enough to play on your own. Check out these fun favorites for church youth groups to worship God. This redesigned version of Amazing Grace screams campfires but still sings praise to God. The tempo and lyrics are easy to remember. Additionally, the music can easily be played with an acoustic guitar. The memorable lyrics and easy to follow melody make this song a fun pick for church camp. The tempo of the beat is also easy to follow without music. A common song sung on Sunday mornings, most youth groups will easily pick up the lyrics and melody of Lord I Lift Your Name on High. The melody is also easy to clap to. Awesome God by Hillsong UNITED offers repetition of lyrics and an upbeat tempo. Clapping and swaying are a must with this song. This version by Lenny LeBlanc offers a catchy chorus and mellow tempo that can help to wind down the night. The melody is easy to follow without music as well. Sing the Lords praise with through Glorious Day. The fun lyrics and message make this a great campfire worship song. When looking for popular worship songs for youth groups, there are many places where you can search. A local Christian bookstore will probably carry CDs from artists that write worship songs in different styles, ranging from old hymns to modern rock bands, such as Skillet. Youth leaders looking for songs to play during a youth worship service might also look on iTunes or Pandora. Check out a few different songs. With the upbeat guitar and grunge like sound, Take My Life offers a unique take on praise for youth groups. Jeremy Camp's raspy vocals add a fun twist that teens will enjoy. The heavy rocker guitar riff of this praise song adds a beat that get teens pumped up and ready to worship Jesus. The lyrics are also catchy and fun. The high energy beat has you imagining teens jumping up and down as they repeat "We are the people of God." Beautiful One by the Tree takes it down a notch but still adds an interesting riff and catchy lyrics that teens will enjoy. The mellow tone will have them swaying and singing along with the lyrics. Charlie Hall's Marvelous Light falls somewhere in the mix between being pop and rock. However, the message is easy to grasp through his clear voice and unique chorus. This upbeat, energetic song gets you hopping while worshipping the Lord. Not only does the beat literally have you jumping, but the message is invaluable for youth group worship. Unhindered offers a dramatic melody that praises the Lord. The music doesn't overpower the words or the message but the lyrics are still catchy and soulful. Teenagers won't be able to not sing to this one. The upbeat melody perfectly surrounds Matt Redman's clear voice in this song. The chorus is upbeat and easy to follow for teens. You can't help but sing along on this one. Teenagers might not always like old hymns during their worship services, but many hymns are being rewritten and recorded by artists such as Chris Tomlin, who recorded his own version of Amazing Grace. Check out some of these other redesigned hymns. How Great Thou Art: Anthem Lights takes a fresh perspective on this old hymn. Hallelujah: Michael Smith makes Hallelujah new again. You Are My Vision: Rend Collective takes this old Irish hymn to a whole new level. Rock of Ages: Jimmy Needham revamps this hymn in his collection The Hymns Collection, Vol 1. Nothing But the Blood: Keith and Kristin Getty give a whole new feel to this hymn in the Hymns for the Christian Life Collection. There are several Christian artists and bands that release new songs each year, and many are geared toward teenagers and young adults. Teenagers who attend a youth group that plays worship songs will probably want to know who wrote the original version, or they might just want to find a new Christian band to listen to. Either way, Google is always a great way to find artists and bands. 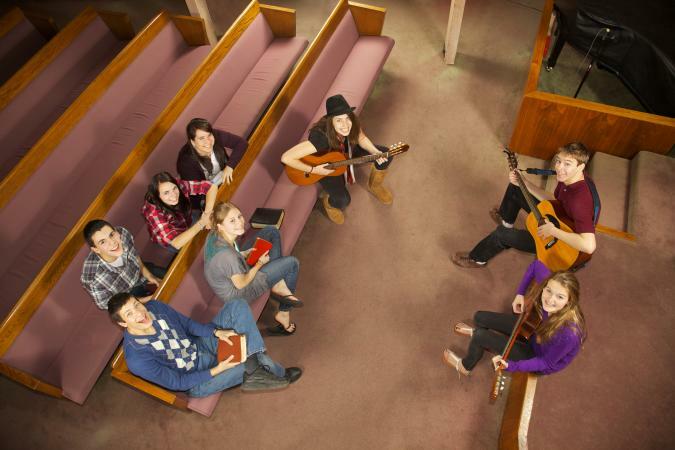 Sometimes finding the perfect songs for youth groups or church camps can be difficult. In order to keep teens interested, not only do you need to offer variety but you need to keep it fresh. Find the perfect mix of songs for your diverse kids to praise Jesus.